In a recent coaching conversation, a client was expressing frustration with her colleagues. They were getting materials to her very late, and still expecting her to meet original (and immovable) deadlines. She felt disrespected, diminished, and angry. Setting boundaries is a goal for this client, and she’s been doing great. The frustration she’s experiencing now is that while her patterns are changing, her colleagues’ aren’t. They aren’t doing anything wrong, per se. They’re behaving as they always have, in the established pattern. My client’s experience isn’t uncommon. Despite how much people rail against the “status quo” in organizations, there is usually an equal amount of subconscious pressure to keep systems operating in the same way. This can exert a lot of pressure on people who are making concerted development efforts. Minimally, they become frustrated, like my client. Worse, they may undo the effort that’s gone into building new, healthier behaviors, and revert back to less healthy ones. For development efforts to be successful, we must recognize that when one part of the system changes, it impacts the rest of the system: the infamous “Butterfly Effect.” In non-scientific terms, this phenomenon suggests that something as minor as a butterfly flapping its wings can cause a ripple effect as large as a hurricane elsewhere. Those ripples exist in our organizations, and they cannot be overlooked. This quote – one of my absolute favorites – was offered to me by Frank Ball, a Master Coach and former Program Director in the Georgetown Leadership Coaching Certificate Program. This was precisely what had been happening for my client. She hadn’t yet renegotiated her relationships by letting people know what she was up to. Ultimately, she chose to address this with her colleagues and to ask for their support. Had she not, over time, her frustration could have led to deep resentment and had more of a “hurricane” effect on the system. 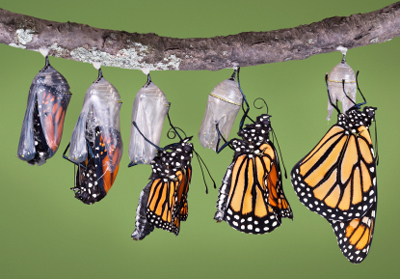 Ignoring the internal “butterfly effect” poses a real risk to development efforts in an organization. How can you ensure that your efforts to develop new habits are supported? Tell people what you’re working on – Research shows that people who tell others that they’re consciously working on shifting certain behaviors report greater returns on their development investments. Colleagues often subtly and subconsciously adapt once they know how diligently you’re working. A “heads up” goes a long way here. The pace of our work lives can dull people’s ability to notice on their own. Ask for feedback – Following on to #2, once you’ve given people the heads up that you’re working on something new, ask them how you’re doing. “How could I do this even better?” is a powerful question that enrolls others in your effort. These behaviors are not only important for you to get support, but are critical for you as a leader to be a role model for others. Behaviors like these encourage others to engage in their own development efforts, and contribute to building a culture where learning and development is more than a check the box activity.